One of the most important but oft-neglected spaces in a home is the bathroom, particularly if it’s small. We tend to think that a small, cramped bathroom is irremediable, that nothing can be done to convert this area into a classy and enjoyable space – but we can’t be more wrong! With an expert team of architects, there’s absolutely no reason why even the smallest of bathrooms cannot have a dash of style within a functional décor! With this in mind, we bring to you 5 marvellous ideas to help inspire you to transform your small bathroom into a functional and trendy area! Let’s get started! 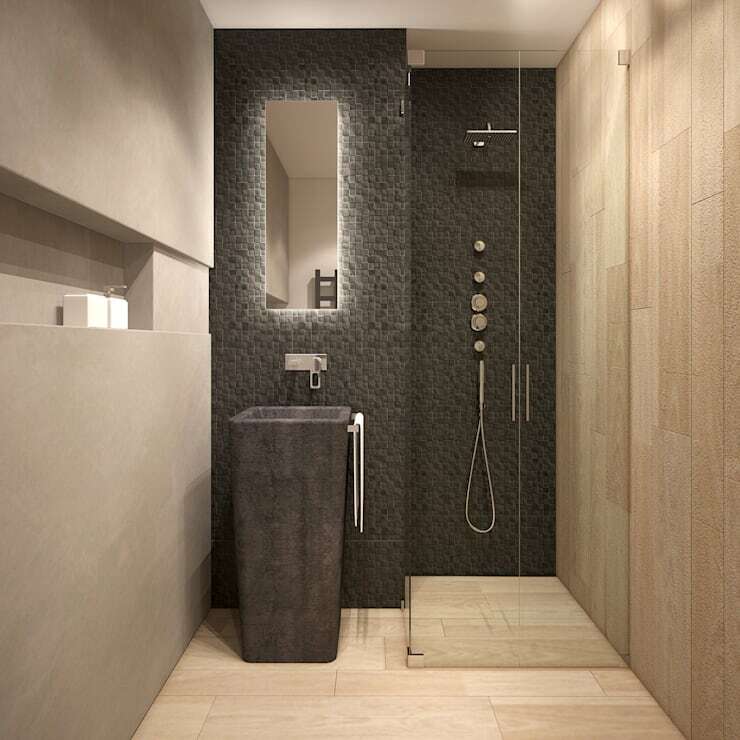 Who would have thought that a narrow bathroom could look so sophisticated! The warm, rustic palette and textures are teamed with elegant fittings and recessed lighting. The unique washbasin is small yet stylish while the long mirror and glass panels of the shower cubicle look very refined. The recess in the wall is a perfect space-saving way to store toiletries. The serious lack of space in this tiny bathroom was dealt with, firstly, by the selection of curved sanitary ware that fits like a jigsaw puzzle – trendy yet saves space! Secondly, the choice of recessed lighting over the lively yellow tiles is perfect for a modern, stylish look. 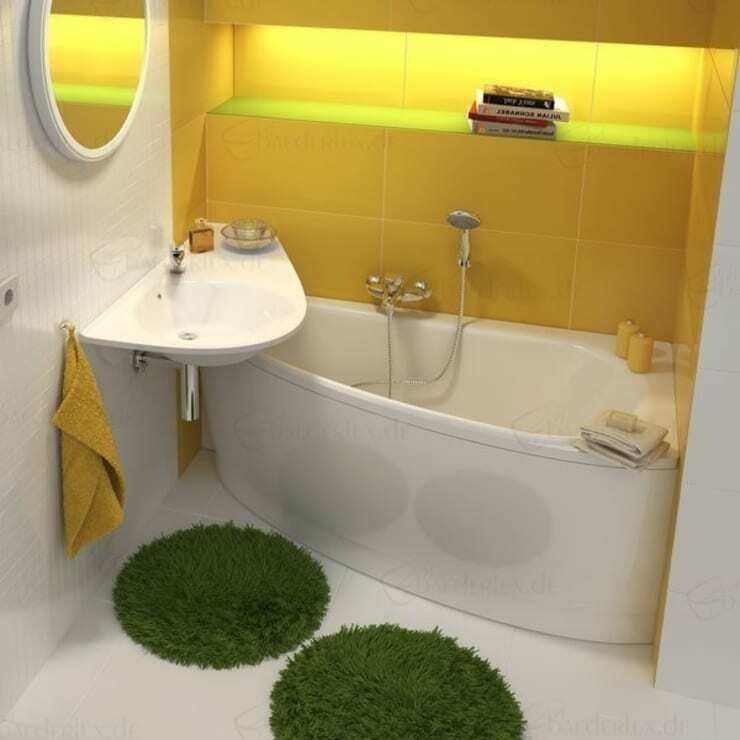 The recess in the wall is ideal for storing toiletries and the plush green turf-like bathmats are a playful addition. 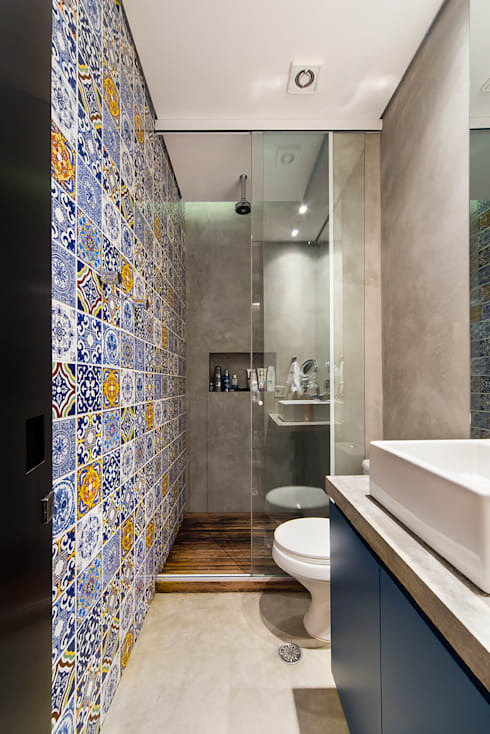 One entire wall consists of beautifully patterned tiles – a stunning element that diverts our attention from the small size of the bathroom! The sanitary ware is sleek and stylish and the pretty blue cupboard below the elegant washbasin matches the accent wall. From the accent wall to the subtle hues of the other walls to the wooden floor and recess for toiletries in the shower cubicle, all the elements have been planned to perfection! 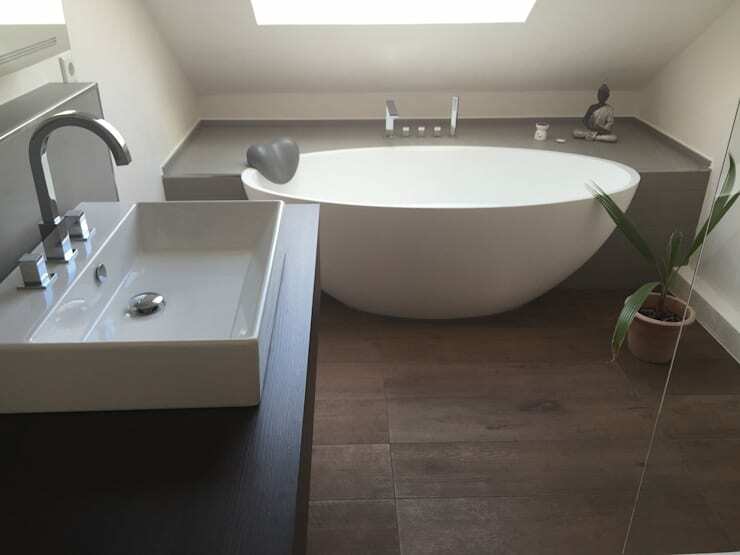 A skylight is ideal in a loft bathroom – it includes natural light and reduces stuffiness. This small but oh-so-trendy bathroom looks marvellous with its stylish grey and white décor that is further enhanced by the rich wooden floor. A big thumbs-up to the amazing washbasin! ​5. How About A Wall To Attract Attention? The exuberant accent wall is a bold statement in the small bathroom, diverting our attention from the size. The pink and white walls, wooden furniture, sleek sanitary ware and pretty plants all come together to form a delightfully playful ensemble! The large mirror creates the illusion of space while reflecting and doubling the impact of the accent wall. Get inspired by these 5 stunning ways to optimize your small bathroom! Here are few more ideas that might inspire you - 5 points must be considered when designing a open kitchen!